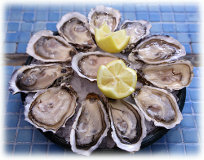 Seafood Restaurants and Dining in Citrus County Florida. Citrus County is situated on the gulf coast of central Florida and has seven major rivers flowing across it. This means both saltwater and fresh water seafood is available everywhere. The Gulf of Mexico offers up opportunity to go deep sea fishing in your own boat or on a guided tour with an experienced fishing guide. The daily catch can include; Redfish, Spotted Sea Trout, Jack Crevalle, Sheepshead or shallow water Grouper, Cobia, Mackerel, and of course Tarpon. In fact, the world record Tarpon was caught just off the coast of Homosassa Florida. Of the seven rivers in Citrus County, the major ones include the Crystal River, Homosassa River, Chassahowitzka River, Withlacoochee River, and Rainbow River as well as the barge canal. All offer excellent freshwater fishing. The county offers many public boat ramps and launches as well as many piers and docks to fish from. Crystal River features a variety of fish species. You may catch redear sunfish, largemouth bass, spotted sunfish, trout, bluegill, tarpon and redfish. This river also connects to the Gulf of Mexico. As you get closer to the river's mouth, expect deeper water and bigger fish, even sharks. There is a lot of action on this river, especially during warmer fishing seasons. You'll find both freshwater and saltwater fish in the Homosassa River's headwater springs, less than a 20 minute drive from Sugarmill Woods. This river was named one of the top 12 fishing spots in North America. Redfish and sea trout are available all year long, while cobia, tarpon, bluegill mackerel, trout, jacks, mangrove snappers and lady fish are available at different times of the year. The Chassahowitzka River has one of the most scenic landscapes in Florida. The river is home to many species, including largemouth bass, bluegill and shellcracker. These waters are only accessible by a boat or canoe. The river is mostly clear and shallow and runs through 30,000 acres of the Chassahowitzka National Wildlife Refuge. Lake Tsala Apopka in Inverness and Lake Rousseau in Dunnellon offer some of the best bass fishing in Florida as well as catfish, bluegill and shellcracker. If you are not a fisherman, you can still enjoy all the fresh seafood that Citrus County has to offer. 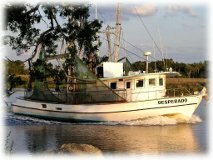 There are many commercial fishing boats that work out of Crystal River and Homosassa, as well as Inglis and Yankeetown to the north. Fresh catches of Gulf shrimp, oysters, bay scallops, and stone crabs, as well as all that fresh fish are common during the various fishing seasons. There is even a scalloping season for residents to go and try their hand at collecting their own fresh scallops. The season runs from mid June to mid September. The area around Sugarmill Woods and Citrus County are dotted with seafood restaurants offering up a wide array of this sea bounty. Stumpknockers offers up their famous catfish dinners. Peck's Old Port Cove at the end of Ozello Trail is a local favorite for blue crabs as well as the Riverside Crab House in Homosassa. The notorious Freezer in Homosassa offers everything from smoked fish dip to steamed, seasoned shrimp from right off the boat. And the newer Neon Leon's Zydeco Steakhouse offers up the Creole & Cajun side of seafood with everything from gator tail to oysters. If you love seafood, you'll be right at home in Sugarmill Woods! 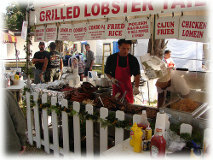 Just make sure you don't miss the annual Stone Crab Jam as well as the annual Homosassa Seafood Festival and the Yankeetown Seafood Festival.